Bloomberg Sports Anchor Rob Shaw discusses both the American and National League playoff picture as we head towards the last few weeks of the regular season, while highlighting some of the possible key players that may help their team get into October. He is trying to maintain his hot early start to September where he hit nine home runs and had 17 RBIs in only nine games. Though he still strikes out a ton, Buck Showalter will find a place for him in the lineup because of his prodigious power. In his all-important contract year, Upton has gotten very hot over his last 30 games up to Wednesday, where he has hit .292 with 12 home runs and 24 RBIs. At 37 years old, you would think Hunter would be slowing down, but he is having actually a career year hitting .309 with 15 home runs, nine stolen bases, 76 RBIs and 72 runs scored despite missing half of May with an injury. He is trying to hit over .300 for the first time in his career. After starting out miserably this season with the major league ballclub, Donaldson was sent down to the minors on June 13th where he reaffirmed his potential by hitting .335 with 13 home runs in just 51 games. He quickly earned a call-up back with the A’s where he is now hitting .324 with six home runs and 17 RBIs through 28 games. This 26 year-old former top prospect missed all of last season while recovering from Tommy John surgery, but has re-emerged this year as one of the Braves best starting pitchers. He has been especially hot as of late, winning seven straight starts since July 31st. Bloomberg Sports Anchor Rob Shaw breaks down four players who fantasy managers may want to pick up off the waiver wire this week. The Pirates are trying to stay in contention for the playoffs and they have gotten some help on offense from an unlikely source in McKenry. In 47 games, he’s batting .285 with 11 home runs and 28 RBI. He has eight homers in his last 21 games alone. If you need a catcher and McKenry is available, he is a good pickup, though it’s unlikely that he will sustain these numbers. The A’s have had some issues in the bullpen as rookie Ryan Cook has struggled recently. This opens the door for Balfour, who last gave up a run on June 29. He is 2-2 with seven saves, a 2.60 ERA and a 1.02 WHIP. The coaching staff has acknowledged that it has to consider moves within the bullpen as the team is in contention, and Balfour is a likely option for the closer role. Vitters was the third pick of the 2007 draft, selected ahead of Matt Wieters, Madison Bumgarner and Jason Heyward. The top prospect made his debut for the Cubs on Sunday. In 110 games at Triple-A, he had a .304 average, 17 home runs and 68 RBI. Kratz played seven years at Triple-A and had a .288 average with 15 homers last season. He’s making the most of his opportunity with the Phillies, batting .379 with four home runs and four doubles in 15 games. Kratz should do well as a backup while Carlos Ruiz is on the disabled list. Since about a third of opening day closers lose their jobs to injury or poor play every year, it’s not the greatest position in which to invest heavily. Instead, waiting to the end of the draft and using the quantity-not-quality approach to supplement an elite closer can provide the best return on investment. Mix the risk in your closer portfolio, in other words. This spring, we’re seeing the merits of this approach already. In Oakland, Andrew Bailey saw Dr. James Andrews on Tuesday, and though it’s just a right forearm strain, he is known to be slightly frail. The former starter and ROY had Tommy John surgery in 2005 and only managed 49 innings last year because of an intercostal strain and some elbow surgery to get rid of loose bodies in the joint. Add the current forearm strain in, and he is a substantial injury risk. That is, perhaps, why the Athletics stocked up on bullpen talent last year despite having a strong bullpen in 2010. Brian Fuentes has managed to put up more than 20 saves in each of the last six years, but comes with some flaws of his own. He’s an extreme fly-ball pitcher (33.5% career GB) who doesn’t do as well against righties as he does against similar-handed pitchers (11.34 K/9, 2.86 BB/9 versus lefties, 9.24 K/9, 4.16 BB/9 against righties). Fellow new acquisition Grant Balfour will figure in the mix somehow if Bailey goes down for an extended period of time. Since he’s a righty, Balfour could contribute some saves as part of a platoon (10.10 K/9, 4.11 BB/9 versus righties). But Balfour, despite the unfortunate last name, is also pretty good against lefties (10.48 K/9, 4.51 BB/9), and if the team can stomach his occasional control blips, he might be the closer all by his lonesome. Last year, five pitchers accrued saves for the Athletics, and Michael Wuertz was second to Bailey with six. If the 35-year old Fuentes declines further (he used to put up strikeout rates closer to ten than to eight) or the inconsistent Balfour can’t find the zone, Wuertz may again put up some saves. 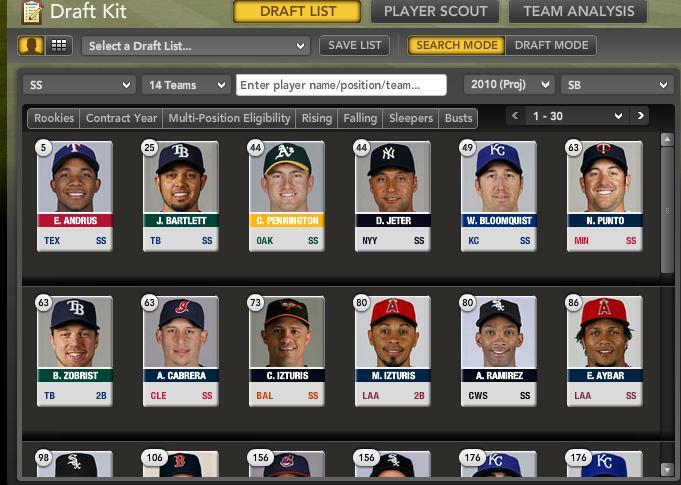 Either way, it’s likely that another half-dozen Oakland pitchers will accrue saves in 2011. We all have to chase the save, and yet it’s the only stat that usually rewards a specific role on each team. Since pitchers are already more likely to get hurt than position players, and the closer role is so volatile on it’s own, it’s a good idea to spread your risk around as much as possible. Sure, get a stud closer early on, but then mitigate your risk late by taking fliers on pitchers like Fuentes and Balfour. If it doesn’t work out, you didn’t spend much on them, and then you can easily drop them for the next pitcher that starts accruing saves. We’ve already covered the Athletics’ trade of Vin Mazzaro. The preface to that deal involves the A’s winning the negotiating rights to Hisashi Iwakuma. Yes, Iwakuma is from Japan, which means the level of knowledge about his pitching abilities and potential sits lower than most domestic products. Keith Law ranked Iwakuma as the sixteenth best free agent available this offseason. Noting Iwakuma’s upside as “mid- to back-of-the-rotation guy” and stating that his delivery is “more conventional” while his mindset is “pitch-to-contact.” Law also offered a scouting report on Iwakuma’s stuff. The basics being that Iwakuma sits in the low-90s while relying on his secondary pitches throughout at-bats. All of that information combined with the knowledge of Iwakuma’s park and division make it easy to set the baseline projections around a league average performance. Going a step further, though, how have previous Japanese starters fared in making the move? Overall impressive, although one has to keep in mind the inherent survivor bias. There are Japanese pitchers like Kei Igawa whom received a ton of cash and quickly bombed out of the rotation. There is no guarantee Iwakamu will avoid that faith in 2011 and particularly not in 2012. Kawakami had the third best debut season and Atlanta Braves removed him from their 40-man rotation over the weekend. Meanwhile the stories of Nomo, Irabu, Ishii, and Matsuzaka are common in the public consciousness. Iwakuma looks rosterable (at least to begin the season) with an ERA projection around 4.00. 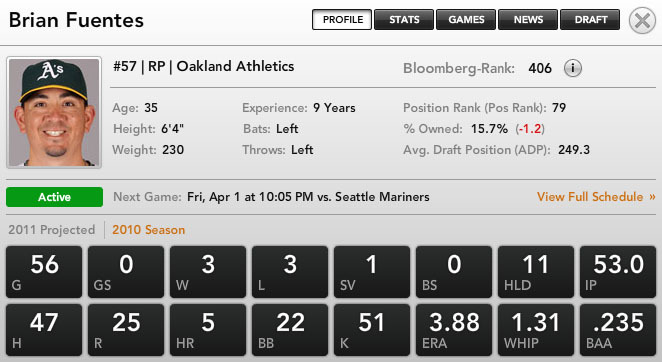 For more on Hisashi Iwakuma and mid-rotation candidates check out Bloomberg Sports’ Front Office. The A’s made an unusual splash on the open market this season when they signed Ben Sheets to a one-year, $10 million deal. Sheets missed all of 2009, but when healthy is a legitimate ace. The gamble for Oakland was him staying healthy. Unfortunately for both sides, Sheets would last just 20 starts before needing major arm surgery. Not only did the surgery wipe out the rest of 2010, but most likely all of 2011 as well. Even before the surgery, the righty was just 4-9 with a 4.53 ERA. 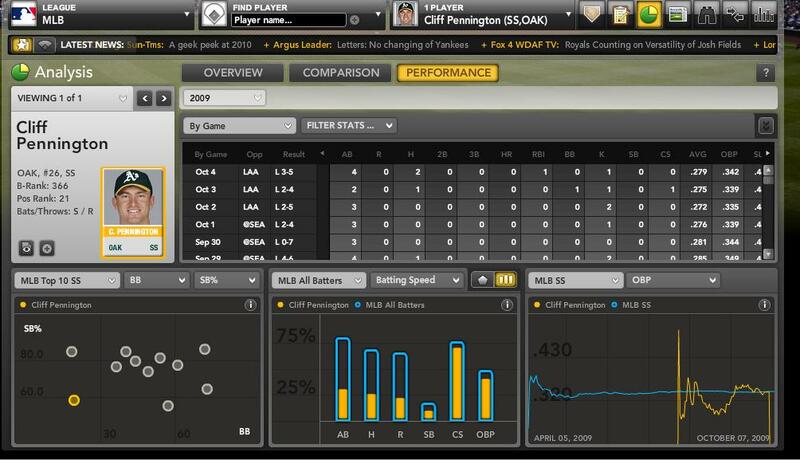 While Cahill has grabbed most of the attention, Gio Gonzalez might be the most talented young arm in the A’s rotation. At 14-9 with a 3.35 ERA, Gonzalez is finally living up to the hype of a top prospect. He has an above-average strikeout rate (7.57 K/9 IP), but walks are still an issue (4.04 BB/9 IP). He’s young, he’s talented, his numbers don’t suggest much of a fluke, and he’s left-handed; a keeper. As mentioned, Cahill has really good traditional stats, but a quick check of his peripherals show he has not been as impressive as those numbers suggest. 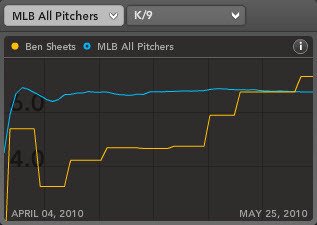 His 5.31 K/9 IP is poor and his 2.89 BB/9 is acceptable, but only with a higher strikeout rate. In addition to the mediocre control rates, his .237 batting average on balls in play (BABIP) is not likely to be repeated again (league average is typically around .300). Cahill is a fine young pitcher with a terrific groundball rate (55.7% ranks among the league leaders) and plenty of room to improve. But buyers beware next season – his ERA’s likely to rise, and 17 or more wins might be a reach. For more on Trevor Cahill, Gio Gonzalez and the rest of the Oakland A’s pitching staff, check out Bloomberg Sports’ Fantasy Kits. Search for Chris Carter on most baseball sites, and you’ll have two options. One plays backup outfield for the Mets and is known as the “Animal” for his sideline calisthenics and intense demeanor. The other, with “Vernon” as a secret first name, is an ever-smiling cuddly bear, with well-above-average power. He’s the one who was just called up on Monday, and he’s the one who is interesting for fantasy baseball owners, despite some notable flaws. Before this year, it might have been hard to figure out why Carter wasn’t in the major leagues yet. Going into 2010, he was 22 (which is neither too old nor too young to take seriously as a major-league-ready prospect), had a .290 career batting average in the minor leagues, had played in Double-A for consecutive seasons, and had amassed 92 home runs from 2007 to 2009. That is an impressive resume for any minor leaguer, and since the Athletics have been so power-starved in the major leagues, his callup seemed inevitable. But the team knew better. The A’s promoted him to Triple-A instead of the majors late in 2009, and his .259/.293/.519 line showed he had something to learn (even though that line came in just 58 plate appearances). It’s the sort of news that should make a fantasy manager delve back into the numbers to figure out why the masher wasn’t mashing in the bigs. With a critical eye, the reason jumps out at you. A 27% strikeout rate in the minor leagues is a big warning sign. Think back to our discussion of possible post-hype sleeper Chris Davis in the off-season, and you might remember that Davis was posting similar strikeout rates in the minor leagues before struggling in the majors. In fact, Davis’ 26.7% career minor league strikeout rate is eerily similar. So is that it? Case closed? Carter = Davis, struggles to come? Well, in his first game in the bigs, it certainly seemed that way. Carter couldn’t lay off the outside slider and wound up striking out twice in two at-bats. And Davis even had a better batting average (.313) in the minor leagues. You could be forgiven for being concerned. Not so fast. Davis, as we said, needs to walk more to get the Three True Outcomes thing down. Those three outcomes – walks, strikeouts and home runs – work well in tandem, but not so well if you are missing the walks or home runs. Davis’ walk rate in the minor leagues (8.3%) was passable, but when it inevitably dropped upon joining the big league squad (6.5%), he was a below-average batter. Carter’s 12.2% number in that category on the other hand can survive a drop and still be playable (8.6% is average this year). contact, but when he does, the ball could go a long way. Vernon Christopher Carter smiles like Ryan Howard, and fantasy managers in long-term leagues should pick him up immediately and hope he can eventually play like the Phillies first baseman too. A warning, though: Carter’s contact issues, and the fact that he’s struggled to get going at new levels, mean that he might not be a great option in shallow mixed leagues. 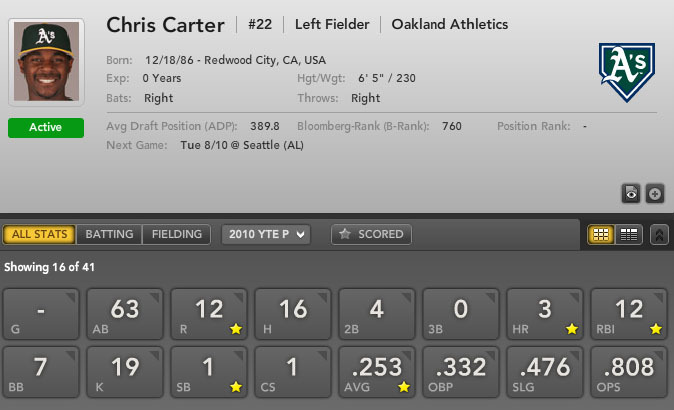 For more on Vernon Christopher Carter and other big callups, check out Bloomberg Sports’ Fantasy Tools. list of cheap shortstop SB candidates: the Oakland Athletics’ Cliff Pennington. behind these two, and he’s not even being drafted in most leagues. shortstops, we find that Pennington ranks behind only the Rangers’ Elvis Andrus and the Rays’ Jason Bartlett in projected swipes at the position in the AL. a capable thief. Pennington looks like that kind of base stealer: In 2009, he swiped 27 bases in 99 games at Triple-A. For his career, he has 107 steals in 476 games. team, not an all-around threat. league, check out Bloomberg Sports’ fantasy kits.